Long before I got my hands on the Royal Opera House/Royal Ballet Dido and Aeneas, the film version from 1995, directed by Peter Manuira and with Maria Ewing in the title role, was my go to version. How does it stack up today? Some things that strike me. It’s very naturalistic. It seems to be set in and around a Tudor mansion and the costumes are vaguely that way too. The interludes that are normally danced are filled in with “busy” scenes that try to inject some feeling but aren’t nearly as effective as Wayne McGregor’s dancers. The hunt scene has dogs and spears and a real boar’s head (which Aeneas touchingly present to Dido in her bath). 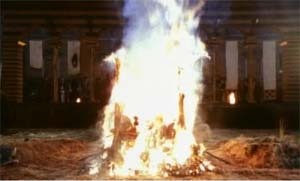 There is a lot of fire including a full blown pyre at the end. For all that it doesn’t seem any more “true” than Wayne McGregor’s much sparer vision. It’s also very emotionally restrained. It’s not really until the final confrontation between Aeneas and Dido that any real emotion intrudes and even then it’s quite restrained This is actually very effective and Maria Ewing is truly affecting in the final couple of scenes. Ewing is good throughout both in the singing and acting department and her looks help (OK I know not everyone goes for Ewing but I think she’s gorgeous!). Karl Daymond is fine as Aeneas. We get a sort of composite Belinda/Second Woman set up with some of Belinda’s music given to the Second Woman and them doubling up on other bits. While Rebecca Evans and Patricia Rosario are fine there really isn’t enough musical or emotional contrast between them and Ewing. Richard Hickox conducts the Collegium Musicum and it’s all a bit low key in common with much else. It’s worth watching for Ewing’s performance in the final act but is otherwise a bit of a snooze. Technically it’s very 1995. The 16:9 picture is hard letterboxed in a 4:3 frame and it’s pretty soft grained. Sound is adequate LPCM stereo. There are English, French and German subtitles. This entry was posted in DVD review and tagged burgess, daymond, ewing, hickox, purcell, rosario by operaramblings. Bookmark the permalink.